Kinfolk – launched to great acclaim and instant buzz in 2010 – is an independently owned quarterly magazine about understated, unfussy entertaining. Both the content and the aesthetic reflect a desire to go back to simpler times; to take a hiatus from the madness of modern life; to build a community around a shared sensibility; and to foster the endless and energising magic that results from sharing a meal with good friends. Now there’s a cookbook from the creators of the magazine, with profiles of 40 tastemakers who love to entertain, and who have each provided one to three of the recipes they most love to share with others, whether they be simple breakfasts for two, one-pot dinners for six, or a perfectly composed sandwich for a solo picnic. 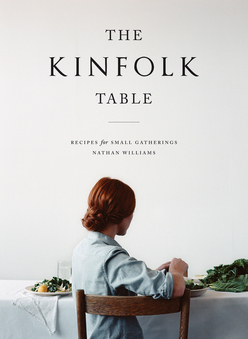 A cookbook that celebrates the pleasures of sharing simple, satisfying meals with good friends, from the team behind the wildly popular and acclaimed Kinfolk magazine. Think Entertaining by Martha Stewart, for a new generation.